Fewer treatments, faster results using PicoSure picosecond technology, the most advanced laser for tattoo removal. We use local anesthetic to make your treatment virtually pain free! Come in for a FREE quote or call us! *Average number of treatments is 6-8. **The area to be treated is numbed based on your body size to tattoo diameter ratio. 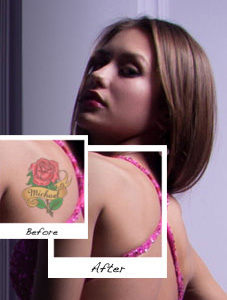 Very small tattoos may be less then $250 per treatment. Contact us for an exact quote.